Posted by Jace Stolfo on Thursday, April 10th, 2014 at 11:21am. 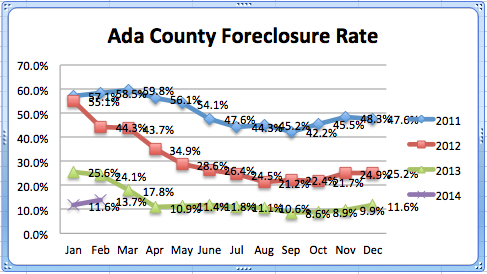 In Ada County, 2014 has marked the lowest foreclosure rate in the market share seen in several years (compared to the beginning of previous years). As you can see in the graph above, February's foreclosure rate dropped 10% from the year prior. The highest foreclosure rate in the last couple of years (shown in the graph above) was in 2011 at 59.8% and has since then dropped dramatically and stayed between 10 and 14% in the last several months. As you can see in the graph below, the absorption rate also has been the lowest this year compared to many years prior. Both January and February had the same absorption rate of 5.0 reflecting the stability of the market. 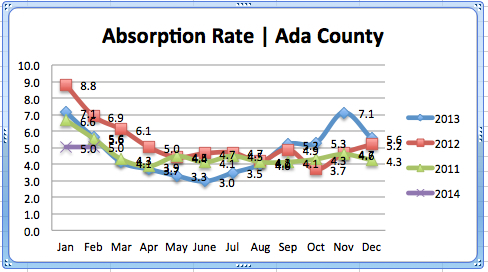 In January 2012 the absorption rate was 8.8 and has since dropped down to 5.0. This can be understood simply by the idea that if 100 homes hit the market at the same time it would take about 5 months for the entire inventory to sell. Total home sales throughout Ada County dropped slightly in February from previous years; 422 homes sold compared to 436 last February. 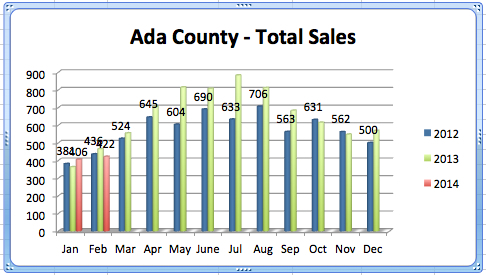 A slight variation in numbers is always normal, and as you can see January of 2014 marked the highest number of home sales throughout Ada County in many years. Historically home sales start to pick up as the weather gets warmer throughout all Ada County cities. 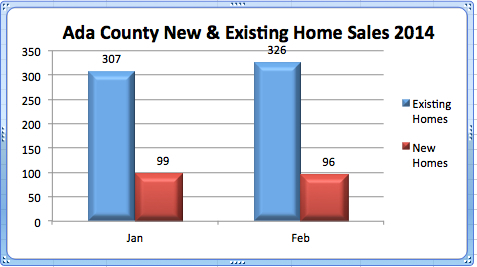 Both January and February have close ratios of new vs. existing home sales throughout Ada County, also a reflection of a stabilized real estate market. In January 24% of home sales were new homes, and in February 22% were new home sales. This is a strong percentage considering 62% of all listings were existing homes in January and 64% of listings were existing homes in February.